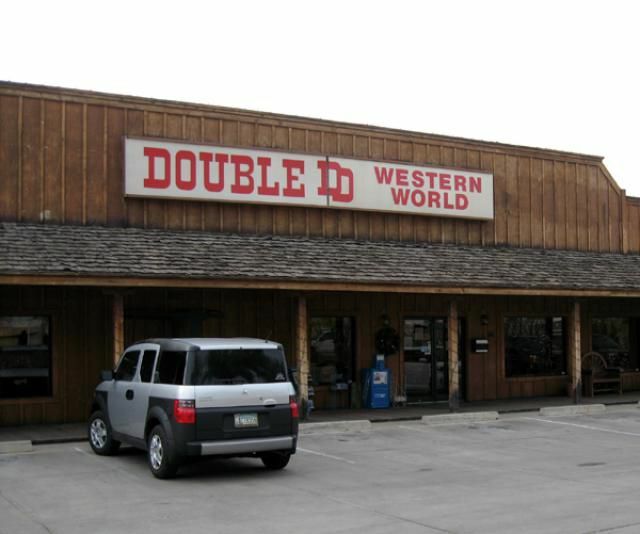 When you drive by Double D Western World on Wickenburg Way, you'd expect that it would be a place for feed, grain and tack. But step inside and you'll be very surprised. We went to Double D one day looking for western dress boots but what we found was beautifully merchandised purses, trendy clothing, home decor and furniture. Yes, you'll find a pair of boots there and a great cowboy hat but this ain't no ordinary western store. It's clear that Double D caters to those who have an eye for fashion and a few dollars in their saddle bags. It's a great place to explore and maybe pick up something to remind you of your trip to Wild West Wickenburg. Double D can be found at 955 W. Wickenburg Way. Map. Their phone number is: 800-225-1230 or 928-684-7987. Here's the purse display at Double D. The selection, all hand-tooled leather with great little western accents, was fairly reasonably priced. Throughout the store you will see displays like this... attractive and current while keeping to the western theme. The merchandise on the upper level includes apparel, boots, gifts, home furnishings, jewelry, art work, and a lower level that offers a variety of saddles, tack, supplements and just about anything else you can imagine that's required for the horse owner. I started shopping at DD Western World as I thought it would be the best place to get a new pair of western boots. When I last went to Rancho de los Caballeros, one of my colleagues had arrived sans riding boots and where did the ranch take her? To Double D! And, as you can see, they had quite a selection of boots. From work boots to amazing reptilian dress boots. But a simple pair of black boots in my size (and my price) were not to be found. That didn't keep us from spending lots of time there looking at all the creative western home decor items and taking a peek at the jewelry counter too! Someone told us to go to Ben's to continue our quest for a great western boot. On the outside, Ben's looks like a simple place where you might go to take your saddle or favorite riding boots to be repaired. But even the casual visitor needs to see this place. Step inside Ben's and you are stepping inside the Wild West tradition of Wickenburg. Look at the old metal ceiling, the tack and western gear to get a sense of what stores were like in the mining days of Wickenburg. But head on to the back and you will see men working on saddles and boots, skillfully repairing them. You might see a local stop by to inquire about a new set of spurs. And you might just find your boots on one of the displays. They have quite a selection ranging, from the simple to the fancy. Ben's can be found at 174 N Tegner St in Wickenburg. Map. Their phone number is: 928-684-2683. I don't believe they have a website. Just so you don't miss Ben's. Here's the outside of the store. It's on the main drag in Wickenburg. Johnson's has been a dry goods company in Wickenburg since the 1930's. Johnson's is located at 72 N. Tegner St. Map. Their phone number is 928.684.2212. Johnson's is across the street from Ben's and is equally authentic. My friend was on the hunt for a Western hat and I was on the hunt for a pair of boots. The owner helped us both find what we needed. We enjoyed the shop which would appeal to ranchers and horse owners as well as "dudes and dudettes." Finding what we needed at a reasonable price ended our shopping for the day. As we headed out of Johnson's my friend exclaimed, "You can't get any realer than Wickenburg." I have to agree. Having found the the Western boots I was looking for, we decided to see what else Wickenburg had to offer. Friends had recommended that we check out Susanne's. The shop is located at 172 N. Washington St. Call 928.668.1148 for hours. As with most shops in Wickenburg, they are seasonal. A Cool Free Event in Glendale: Hot Rods!